Present how to build a business and introduce the core values of a company. 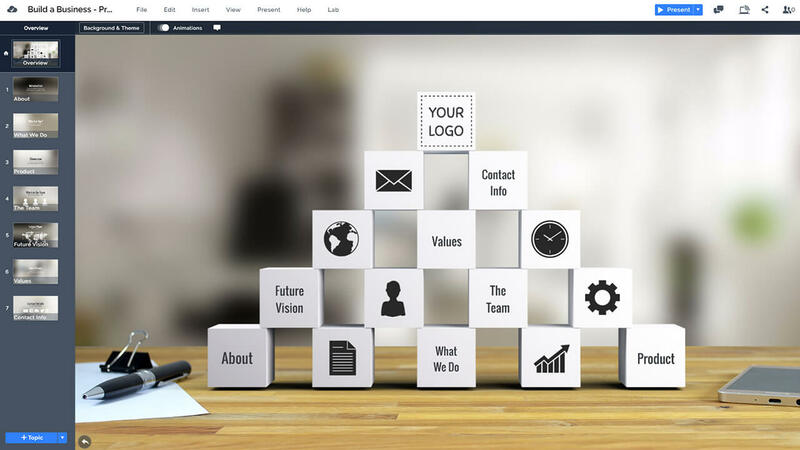 Prezi Next presentation template with building blocks concept. White cubes stacked on top of each other and forming a pyramid. Illustrate each cube with a topic and describe how to build success.Talk about a personal project, business idea or company structure/hierarchy. What are the building blocks and core values of your business? Use this presentation template to talk about building a solid foundation to a business and running a successful company. 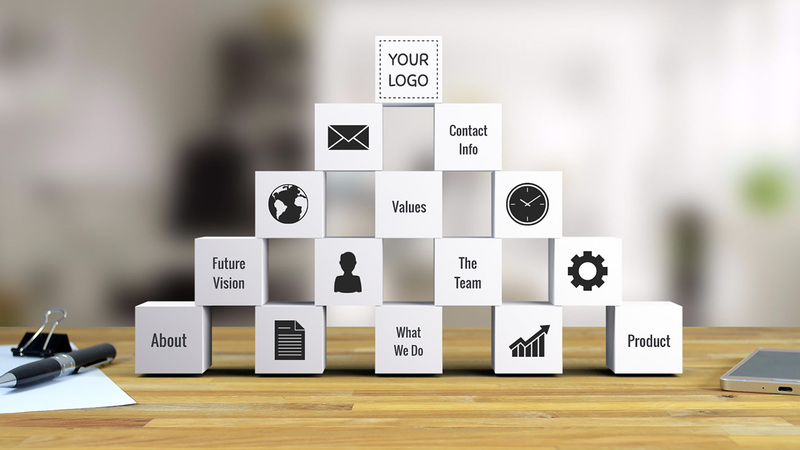 A 3D presentation template with square building blocks on an office desk, laid on top of each other as a small pyramid. A perfect concept for illustrating the core value of a company, startup or simply a project and an idea. The overview slide features all the building blocks on a desk. Customize the template by adding your own texts and icons onto the blocks. Then start zooming into the topics and insert your presentation topic. You can either start from the bottom and talk about the foundation or present in a reverse order and come down from the top section. Present about all the important aspects of a business for example; making plans and goals, finding the right people, getting the project funded, and of course in case this presentation is about business, show the product or service. 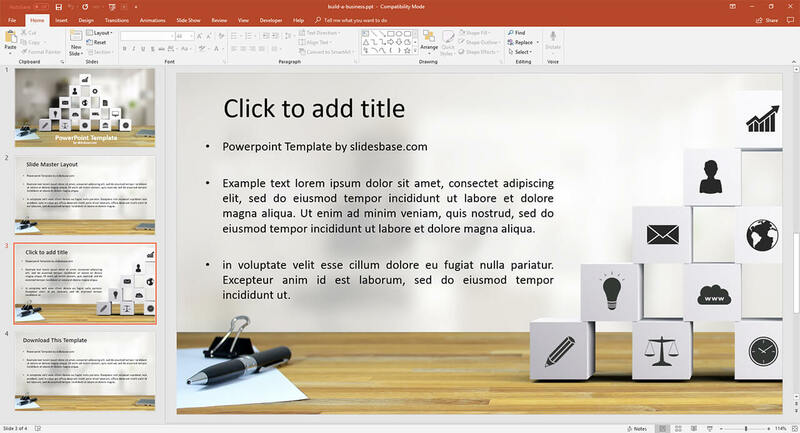 A PowerPoint version of the Building Blocks template is also included in the purchase. The PPT version features the same building blocks design elements with 2 alternative slide layouts and 16:9 screen ratio. So make sure your pyramid doesn’t come tumbling down – present about solid business foundations and strong core values. This entry was posted in Best Prezi presentation templates, Prezi Next Templates and tagged blocks, build a business, build a company template, building blocks, building blocks presentation, business case presentation, business development presentation, business pictures for presentations, business pitch template, business plan presentation, business portfolio presentation, business presentation, business presentation background, business presentation design, business presentation format, business presentation ideas, business presentation images, business presentation ppt, business start up presentation, company foundation presentation template, creative business presentation, desk, foundation, introduce a business, pillars, prezi next template, prezi next templates, start up business presentation, startup template.